Welcome to the Brontë Parsonage Blog: Welcome, Bonnie Greer! Ms Bonnie Greer OBE has accepted the post of President of the Brontë Society and will preside over the Society's Annual General Meeting in June. Ms Greer, pictured here at the Parsonage, said, “The work of the Brontës encompasses some of the most exquisite examples of the beauty, strength, wonder, and depth of the human spirit. This is their gift to us, and the answer that I give the little girl I was long ago, when I asked myself what relevance they had for me, growing up African American on the South Side of Chicago. Chairman of the Brontë Society, Sally McDonald, announced the appointment saying, “The Brontë Society is thrilled that Bonnie Greer has accepted the Society’s invitation to be our President. 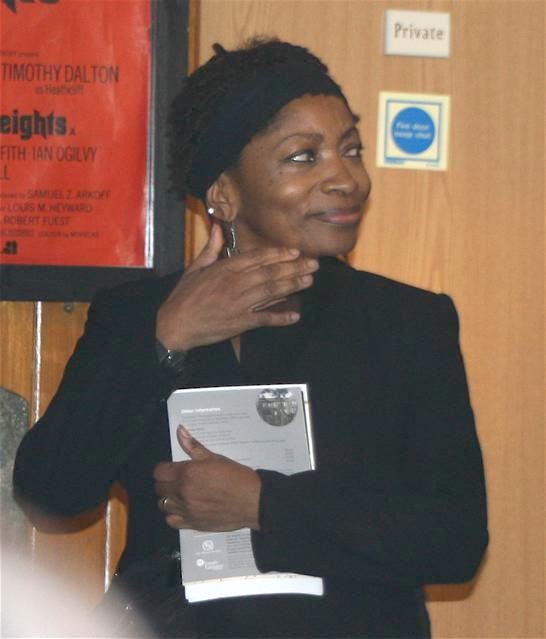 In 2010 Bonnie Greer spoke in Haworth as part of the Brontë Society’s Contemporary Arts Programme, returning soon after to open a newly refurbished exhibition space at the Parsonage museum. She joined members of the Society and spoke eloquently at a fundraising event at Watermen’s Hall, in London, in November, having earlier that day received an OBE from Prince Charles at Buckingham Palace. Bonnie Greer is also the judge of the short story section of the 2010-2011 Brontë Society Literary Competition. That's really good news- I am sure she will be a great asset to the Society. I have heard her speak on more than one occasion and I have been very impressed by what she had to say and also by her down to earth and friendly manner. An inspired choice of president! Is she the first American president? Has this been commented upon in the USA?